In this live training session we will create a flexible player ability system which includes player abilities with cool downs, similar to those seen in MOBA or MMO games. 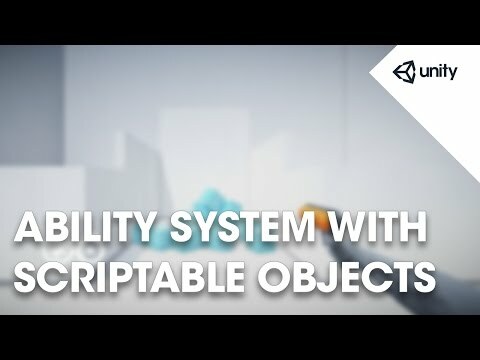 The approach uses scriptable objects and is designed to allow game designers to create multiple variations of an ability and swap between them easily. [HideInInspector] public int gunDamage = 1;                         // Set the number of hitpoints that this gun will take away from shot objects with a health script. [HideInInspector] public float weaponRange = 50f;                   // Distance in unity units over which the player can fire. [HideInInspector] public float hitForce = 100f;                     // Amount of force which will be added to objects with a rigidbody shot by the player. public Transform gunEnd;                                            // Holds a reference to the gun end object, marking the muzzle location of the gun. [HideInInspector] public LineRenderer laserLine;                    // Reference to the LineRenderer component which will display our laserline. private Camera fpsCam;                                              // Holds a reference to the first person camera. private WaitForSeconds shotDuration = new WaitForSeconds(.07f);     // WaitForSeconds object used by our ShotEffect coroutine, determines time laser line will remain visible. //Create a vector at the center of our camera's near clip plane. //Declare a raycast hit to store information about what our raycast has hit.